Objective: to identify the work ability perception, the psychosocial risk factors and musculoskeletal symptomatology among workers of a meat processing industry. Methods: the sample consisted of 74 subjects, 53 female (71,6%) and 21 male (28,4%), with a mean age of 41,9 years old (± 11,3). Data collection was based on a survey including the Portuguese Version of the Work Ability Index (WAI) and of the Copenhagen Psychosocial Questionnaire II (COPSOQ II) and of the Nordic Questionnaire. Results: concerning to work ability, the average value found was 39,38 (± 5,97), considered as good work ability. As to psychosocial risk factors, job insecurity presented critical results and favourable results were found in the scales: role clarity, rewards, social community at work, self-efficacy, work-family conflict and offensive behavior. As referring to self-reported musculoskeletal symptomatology, the region with the highest frequency of complaints was the cervical region with a prevalence of 40,5% (n = 30) of pain/discomfort, with average pain perception of 2,58 (± 3,45) points in the last 12 months. The Spearman correlation test between the variables age and cervical pain (rho = 0,433; p = 0) and between age and low back pain (rho = 0.240; p = 0.040) show that there is a relationship between these variables. 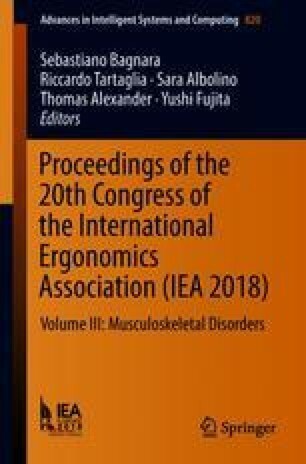 Conclusion: The results of this study point to the need for preventive actions in the meat processing industry, such as those related to work organization (rotation of tasks, adjustment of the production rhythm) and to programs for the prevention of work related musculoskeletal disorders, especially among the women.